Island Conservation staff restructure to enhance partnerships and conservation impact. Organization readying itself to receive and run with new strategic plan. I am excited to help Island Conservation mature into an even more effective and impactful partner and conservation organization. Our planning process is in full swing with our partners, board, and staff. In the meantime, we are strengthening the organization by building a new external affairs department, empowering conservation programs, and deploying our staff resources in the most effective ways possible. A new, fully integrated, science-based Conservation Department has been established to enable efficient programmatic planning and decision-making. The department integrates our field biologists, scientists, and regional programs. Together this team will help set the organization’s conservation priorities through strategically driven programs that maximize demonstrable conservation impact. I am excited to lead this holistic department to empower program staff and enhance our conservation impact. The organization has also established a new Global & External Affairs Department. 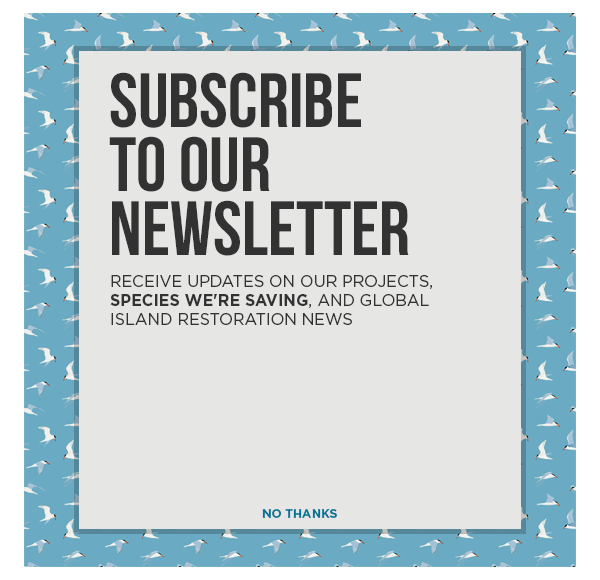 The department is charged with catalyzing island restoration impact through strategic global partnerships and public funding and policies, and to maintain public support for Island Conservation’s interventions. We are doubling down on external and global affairs to collaborate with a growing cadre of partners who are prioritizing island invasive species interventions to save species. Former Director of Marketing and Communications Heath Packard has been promoted to Director, Government & Public Relations. Sally Esposito, who has been with the organization nine years, has been promoted to Director of Marketing and Communications. I’m very excited about Island Conservation’s future! With a renewed focus on building strategic and stronger partnerships, I hope we can have even greater impact saving the incredible endangered and endemic species on islands all over the world. Erin Hagen, Director of Conservation.